Game 6, Rogers WHL Championship Series … the Silvertips have claimed their second Western Conference title in franchise history … first lifetime matchup between the teams in the postseason and the two teams finished in the top three for points in the regular season (Silvertips were 3rd, 99, Broncos were 2nd, 103) … the Silvertips are 14-4-3 in the postseason … it is Swift Current’s first visit to the Championship Series since 1993 … the Silvertips defeated Swift Current in their only meeting in the regular season, 4-1, in downtown Everett on Jan. 21. 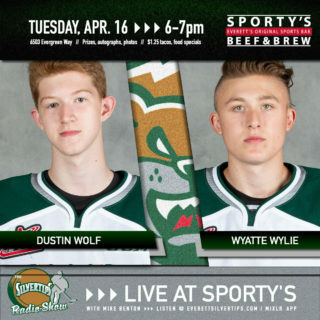 PLAYOFF PRIMED: The Silvertips have never missed the postseason in 15 years of play in the WHL, extending a current WHL record streak … this season they won their sixth U.S. Division title and second Western Conference title … the Tips went 18-7-2-3 in 1-goal games and 25-8-2-1 at home in the regular season. 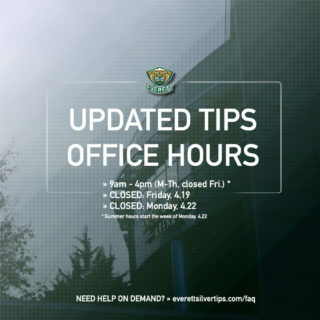 SPREADING IT AROUND: The Silvertips have scored 81 goals in 21 playoff games … 18 players have registered at least a point … 16 different Tips players have recorded a goal. Both Silvertips Western Conference championships have been clinched on the road, and in sudden death overtime … Jeff Schmidt helped the Silvertips (in their expansion year) defeat the Kelowna Rockets, 4-3 in the 2004 series in a 2-1 overtime win at Prospera Place … Kevin Davis clinched the title this season in Game 6 at Toyota Center, 6-5 in overtime in Game 6 over the Tri-City Americans for a 4-2 series victory. GAME 1 (EVT 3 – TC 2 / 4-20-18): Garrett Pilon scored twice and earned the eventual game winner late in the second period, and the Everett Silvertips were able to hang onto the lead to win Game 1 of the Western Conference Championship Series, 3-2 over the Tri-City Americans before 5,181 fans at Angel of the Winds Arena on Friday night. Connor Dewar chipped in with a goal and an assist while Riley Sutter earned a pair of assists. Carter Hart turned in a 24 save effort while the Tips became the first team to hand Tri-City a loss in the playoffs. SHOTS: EVT 33 – TC 26 … GAME 2 (TC 5 – EVT 3 / 4-21-18): Maxwell James broke a tie game in the third period with his first goal of the postseason to help the Tri-City Americans sneak past the Everett Silvertips, 5-3 in Game 2 of the Western Conference Championship before 6,401 fans at Angel of the Winds Arena on Saturday night. With the Tips’ loss against the Americans, the series is now tied 1-1 for the third consecutive round in the Silvertips postseason. 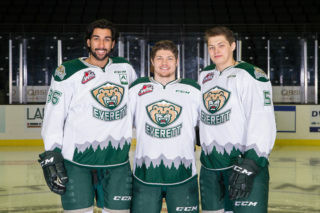 Matt Fonteyne, Patrick Bajkov, and Garrett Pilon each netted a goal on the Silvertips side. The Tips power play netted a 2-of-4 effort, including two tallies in the opening period. SHOTS: EVT 40 – TC 27 … GAME 3 (EVT 8 – TC 4 / 4-23-18): Patrick Bajkov collected his second hat trick of the postseason while Garrett Pilon pumped in three points to help smash a tie game in the third period, en route to an 8-4 victory for the Everett Silvertips over the Tri-City Americans before 3,268 fans at Toyota Center on Monday night in Game 3 of the Western Conference Championship Series. The Tips broke a 4-4 deadlock in the third by scoring four goals in a span of 4:50, taking a 2-1 lead in the series. Carter Hart picked up the victory in net with 29 saves while the Tips set a new franchise record for most goals in a playoff game. SHOTS: TC 33 – EVT 28 … GAME 4 (EVT 3 – TC 1 / 4-26-18): Carter Hart recorded 29 saves while the Everett Silvertips led wire to wire, en route to a 3-1 victory over the Tri-City Americans in Game 4 of the Western Conference Championship Series, before 3,537 fans at Toyota Center on Thursday. 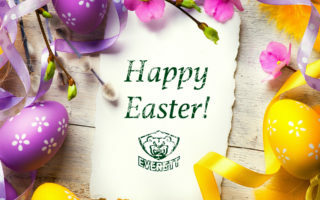 The Silvertips seized a 3-1 lead in the series and can advance to the WHL Championship Series with a victory on Saturday, in Game 5 in downtown Everett. Reece Vitelli earned the game winner while Riley Sutter broke a scoreless tie in the second period. Matt Fonteyne earned he game winner on an empty net opportunity with less than 40 seconds remaining, lifting the Silvertips to a 6-0 road record in the postseason. SHOTS: TC 30 – EVT 26 … GAME 5 (TC 5 – EVT 2 / 4-28-18): Juuso Välimäki scored twice, including the eventual winner for the Tri-City Americans to get past the Everett Silvertips, 5-2 in Game 5 of the Western Conference Championship at Angel of the Winds Arena on Saturday night before a crowd of 7,812. Patrick Dea made 35 saves as the Americans overcame the Silvertips in an elimination game. The Tips lead the series 3-2 as they’ll head back to Kennewick for game six. Connor Dewar scored both goals for Everett in the loss. The Silvertips were 4-for-4 on the penalty kill. SHOTS: EVT 37 – TC 24 … GAME 6 (EVT 6 – TC 5 (OT) / 4-30-18): Kevin Davis capped an elimination comeback on a blast from center point for a game winning power play goal at 5:58 of sudden death to lift the Everett Silvertips to the Western Conference championship and a berth in the Rogers WHL Championship Series, in a 6-5 overtime victory over the Tri-City Americans in Game 6. 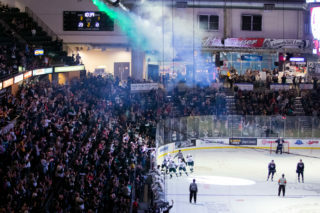 The Silvertips won the series, 4-2 and earned their second Western Conference title in franchise history before 3,033 fans at Toyota Center on Monday. The Silvertips rallied from a 5-2 deficit in the third period with three goals in a span of 4:37 and Garrett Pilon tied the game just 36 seconds after Davis scored his first goal of the night to draw the Tips to within a goal. Patrick Bajkov scored a pair of goals.